On sale in Europe from June and autumn here in Ireland, the new 208 offers both exceptionally economical and efficient Euro6 petrol and diesel engines. 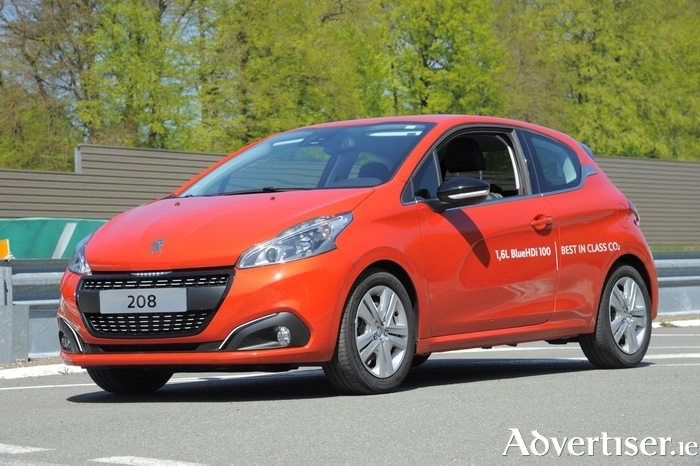 A 1.6-litre BlueHDi 100 S&S Peugeot 208 has set a new long-distance fuel consumption record. Under the supervision of the Union Technique de l’Automobile, du motocycle et du Cycle, the Peugeot 208 covered an impressive 1,337.19 miles (2,152 kilometres ) on 9.45 gallons (43 litres ) of diesel, with an average fuel consumption of an amazing 141.2mpg (2.0 l/100km ). Peugeot says this record confirms the technological excellence of the latest Euro6 BlueHDi Diesel engines and their contribution to the reduction of CO2 emissions. This performance was achieved at the end of April on the Peugeot test circuit at Belchamp in France, supervised by the French Type Approval Authority, UTAC. A strictly standard production Peugeot 208, with the 1.6-litre BlueHDi 100 S&S engine and five-speed manual gearbox, ran for 38 hours and covered 2,152 kilometres while consuming little more than nine gallons of fuel. In doing so, the new 208 set an absolute long distance fuel consumption record for a standard production vehicle. Several drivers were used to arrive at this result, each taking a turn of three to four hours at the wheel. The 208 tested was a ‘very low fuel consumption’ version, available from the dealer network as part of the extensive range. With an official combined drive cycle fuel consumption figure of 94.2mpg (3.0 l/100km ) and low CO2 emissions of 79g/km, it takes its place as the world benchmark for a standard production model powered by an internal combustion engine. This version is characterised by the presence of an aerodynamic rear spoiler and the adoption of ultra-low rolling resistance Michelin energy saver+ tyres. Peugeot says these values are already exceptional, but combined with the dynamic qualities of the new 208 – compact, light, fun to drive - they offer the potential to go even further. Associating selective catalytic reduction and an additive particle filter in a unique way, the BlueHDi technology demonstrates once again that it is the most efficient and effective diesel emissions control system on the market. On sale in Europe from June and autumn here in Ireland, the new 208 offers both exceptionally economical and efficient Euro6 petrol and diesel engines. As regards CO2 emissions, the petrol range offers remarkably well-contained values from 97g/km while with diesel, the BlueHDi range is now entirely below 95g/km. Peugeot is rapidly reducing the CO2 emissions of all of its vehicles in a tangible way. The accelerated implementation of the 3-cylinder PureTech petrol and BlueHDi diesel engines, as well as the new 1.6 litre THP engines and the EAT6 automatic transmission, now places 20 Peugeot vehicles at the best level in their power class for CO2 emissions (five PureTech, three 1.6-litre THP and 12 BlueHDi are class-leading models ). These engines meet the demand by the Peugeot brand for development that takes account of the environment, with in particular, engines that are ever cleaner and produce less CO2. Peugeot’s environmental performance helped the PSA Peugeot Citroen Group maintain leadership in Europe in 2014 with average CO2 emissions of 110.3g/km, in a European market where the average is at 123.7g/km, and as an individual brand the Peugeot product average is 109.5g/km.